Born and raised in Spain, Javier Orduña has already released music on esteemed labels such as Visionquest, Culprit or Get Physical. His musical spectrum ranges from Detroit techno, to house, Acid house, Deep-house, Jazz, Rock and Punk and his tracks have been widely supported by some of the biggest names in the dance game. 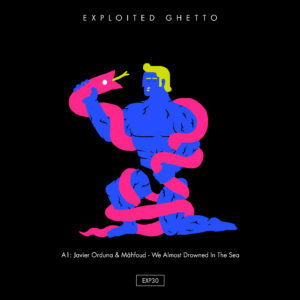 On his debut ’We Almost Drowned In The Sea’ for Exploited Ghetto he teams up with singer Mâhfoud. Mâhfoud is a vocalist, instrumentalist, composer and producer from the Netherlands. His work is often referred to as melancholic, yet goosing. In his latest development he attempts to liaise science and sound into a honest fusion of traditional instruments and electronic driven compositions.